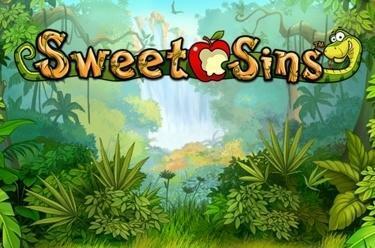 Play Sweet Sins™ online for free now! Sweet Sins™ features up to 25 win lines on 5 reels. The slot is all about the Garden of Eden where the reels are overflowing with Twists. The snake and Adam score the highest winnings. Your aim with Sweet Sins™ is to land 5 identical winning symbols on one of the pay lines. All win lines start on the left side of the reel set and come to an end on the last reel to the right. The snake not only has a split tongue but also plays a dual role in Sweet Sins™: As a Joker symbol she substitutes for all symbols of the game and therefore completes your winning combos but she also triggers 10 free games with bonus symbol when she lands 3, 4 or 5 times in any reel position. Prior to the free spins starting a bonus symbol is randomly selected from all symbols of the game (except for Scatter). This expands when it lands 2 or 3 times (depending on the symbol) to all positions of the revelant reel and pays a win regardless of the pay line course. Like in the basic game the snake symbol is Joker and Scatter symbol in the free games also; only the Bonus symbol it cannot substitute for. Sweet Sins™ is all about temptation! Although, in this slot you don't have to resist it but succumb to it to fetch as many Twists as possible for your player account. 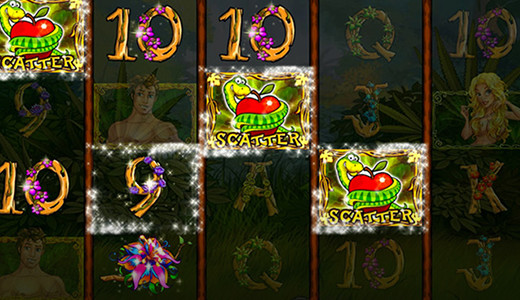 Frolic around the Garden of Eden with Adam and Eve and earn as many wins as possible on reels laden with Twists. And if you encounter the cunning snake don't hesitate to take a bite of her apple - then she will lead you to the most beautiful corner of the garden, the free games!